Well, you may remember that we were staying around Florence, Oregon for Bruce to have a dental appointment. An old crown had become dislodged and we thought it a good idea to have it fixed. So happy to report that Yelp and other apps online gave us good references to Dr. Linton. A beautiful office and well staffed. Quite happy with the quick repair. The above? 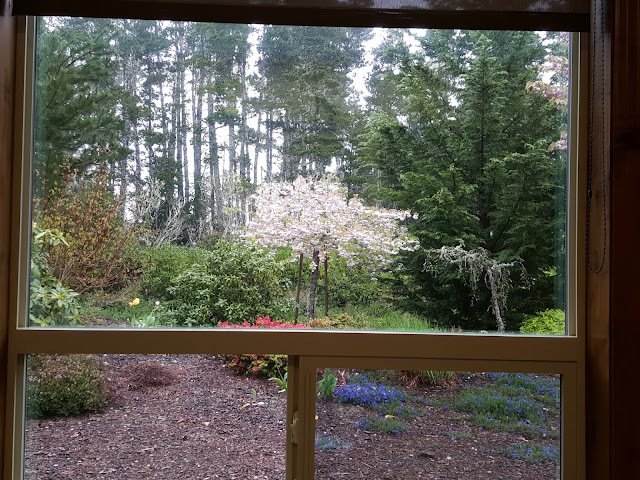 Well that is the view from the dentist chair, a large, wide window out to a colorful garden space. Nice! By the way, my appointment at 3:20----I was in the chair at 3:15 p.m.
Lighthouse, sitting out on a rock ledge. On a rainy day---they have all been rainy but one. Treated to this view, on the path up to the lighthouse, of the rolling surf crashing against the rocks. 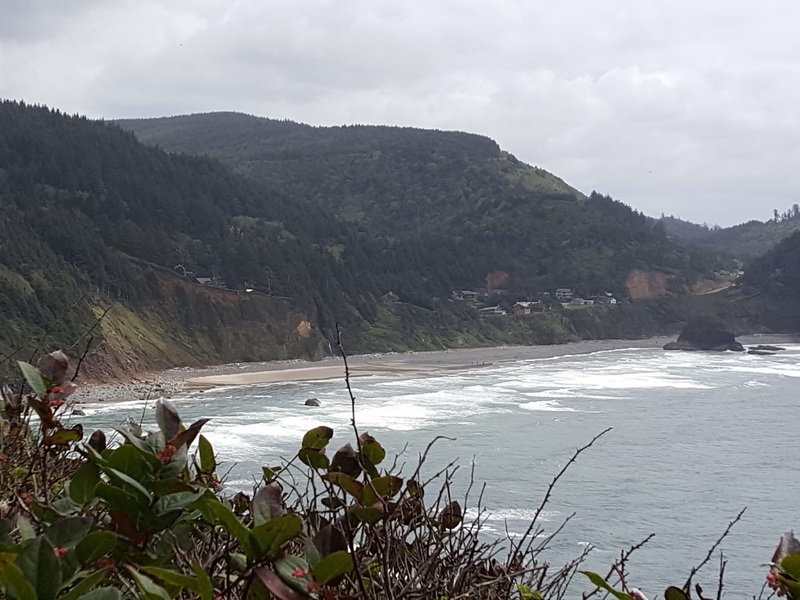 Looking back at Route 101. This bridge was a giant improvement back in the 1930's. The design is eyecatching too. We had parked back beyond the bridge--for RVs. 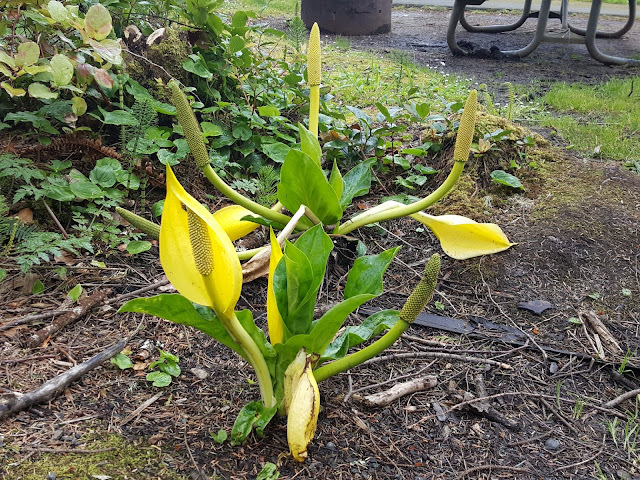 On the climb up to the lighthouse, Jan and I can take a break for a small patch of Calla Lilies. Can you believe it? In the early 1900's, this is the assistant lighthouse keepers residence. This porch has a full view of the ocean. It is open for tours in the summer. Also used as a bed and breakfast--see below. Back a century ago, there were two houses. This one was for the head keeper, now removed. The assistant's, is to the right. 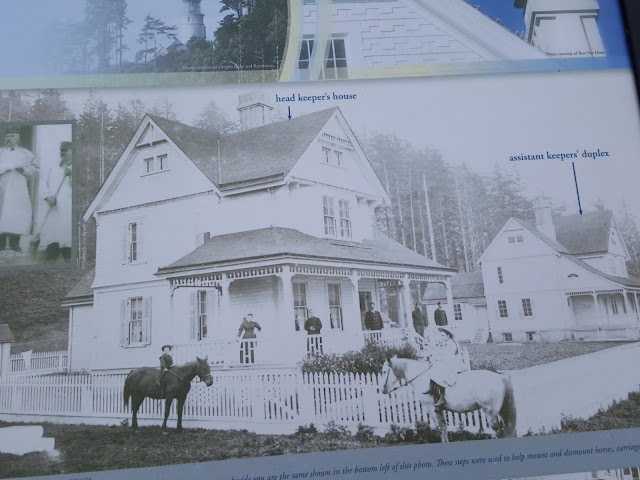 The head keepers house was sold in the mid 1900's , after electricity reduced the lightkeepers chores. It was purchased for $10!! 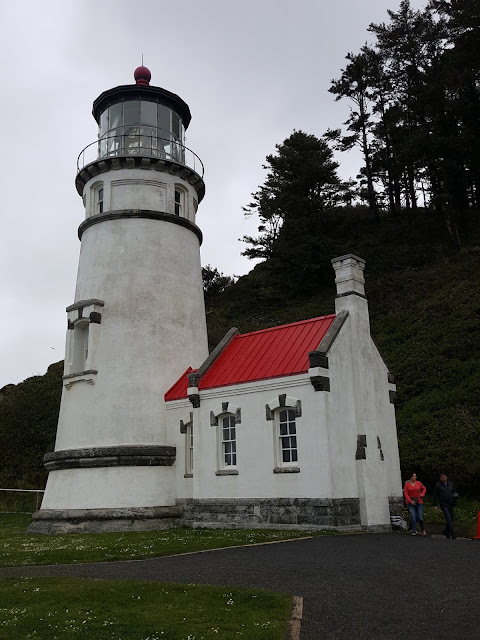 The link above gives some background to the lighthouse. 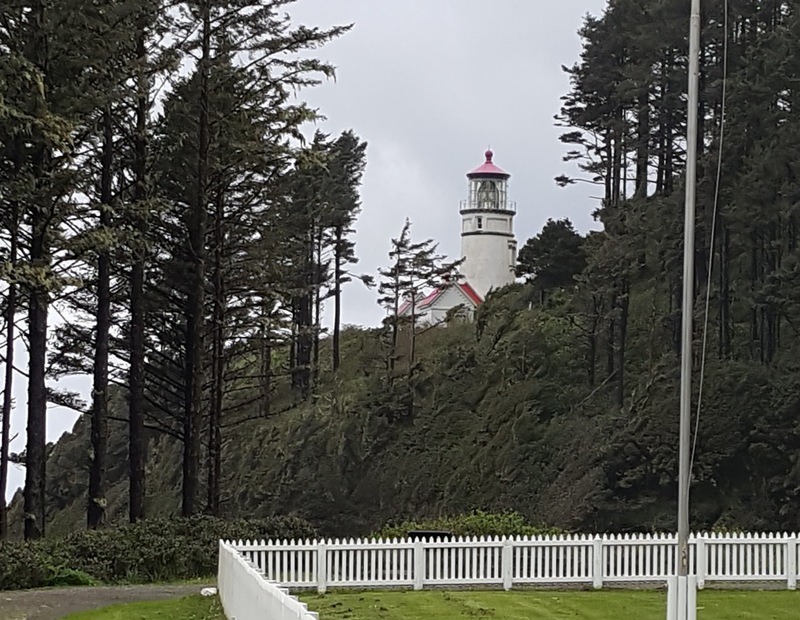 Just note that the first lighthouse keeper-in the 1890's--had to walk 24 miles up the coast to Heceta Head. The bridge and road connection came in the 1930's. Yes, the remaining assistant's house is now a bed and breakfast during the summer months. Before the bridge and road ,some travel and supplies relied on racing a horse and wagon across the sand at full speed during low tide. The view from the assistant's house. There were about 4 guides here this day. Quite an interesting tour and background given. 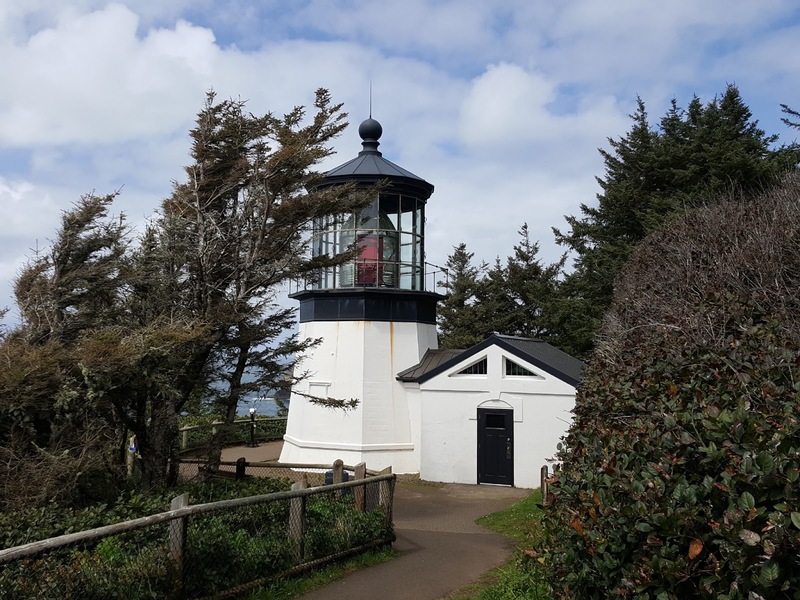 This is one of the most visited lighthouses in the United States. From the lighthouse, we head north again on Route 101 to Route 20 east in Newport, Oregon. 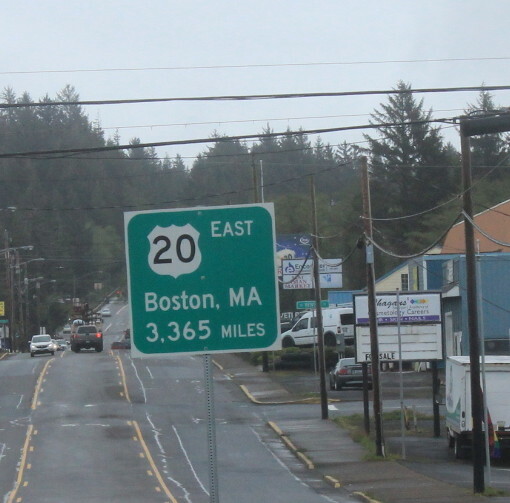 Yes--the same Route 20 that ends in Boston, Massachusetts. This was a recommended park. About 20 miles from Newport in Logsden along the Siletz River. A very quiet park with well tended dry camping sites. Since there were only a few units camping here--note rain---we chose a great one with this view of the quite full river from our windows. That's as close as you go , Jan! The river is running white water, you do not want to wade in. No one we know, but these are pictures posted in the campground of some of the fishing catch. Steelhead are plentiful. 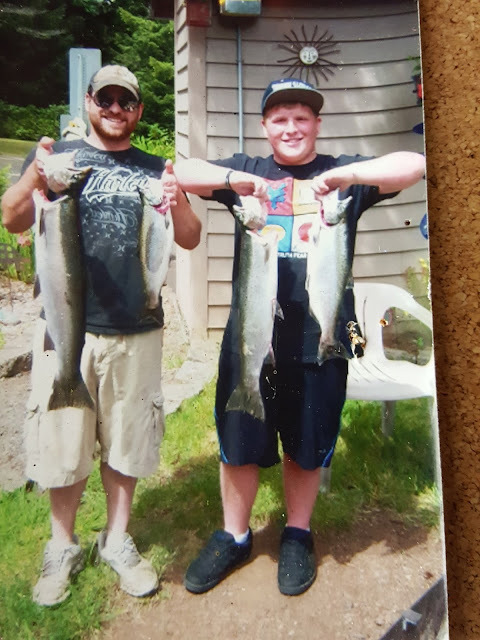 Coho Salmon are listed as currently protected. There were a number of fishermen who came to fish while we were here. A waterfall created by the excess rain. 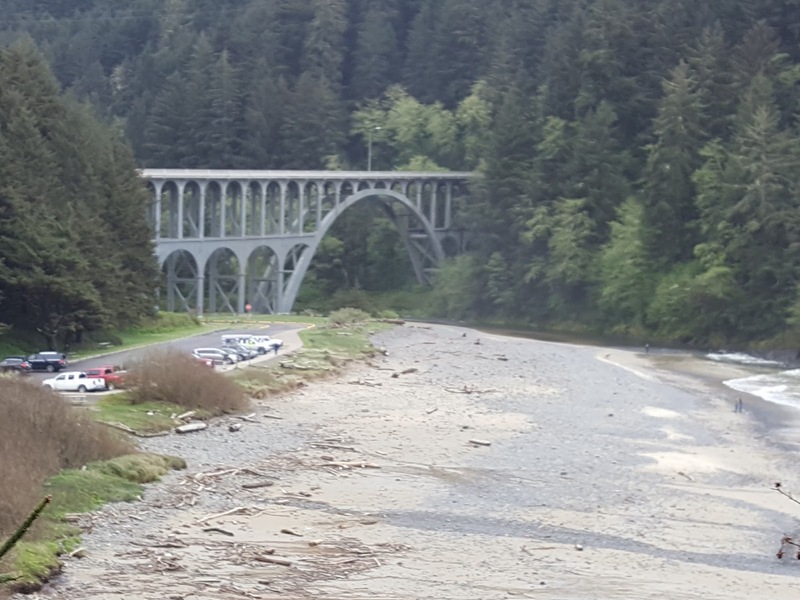 The Siletz runs out to the ocean---hence the steelhead trout that live in fresh and salt water. 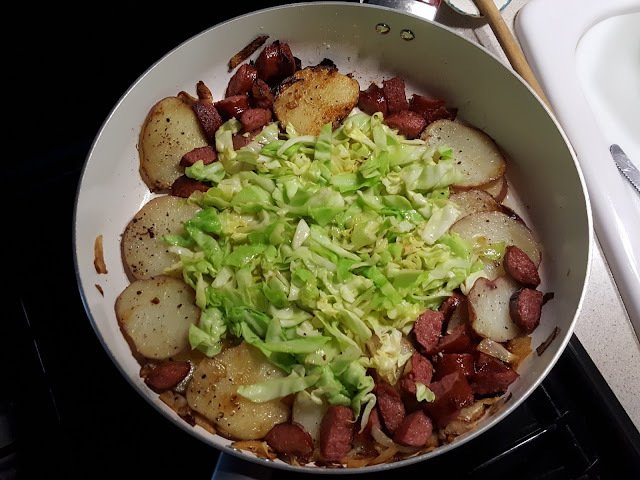 A wet, damp night----perfect for Jan's Cabbage and Kielbasa special. 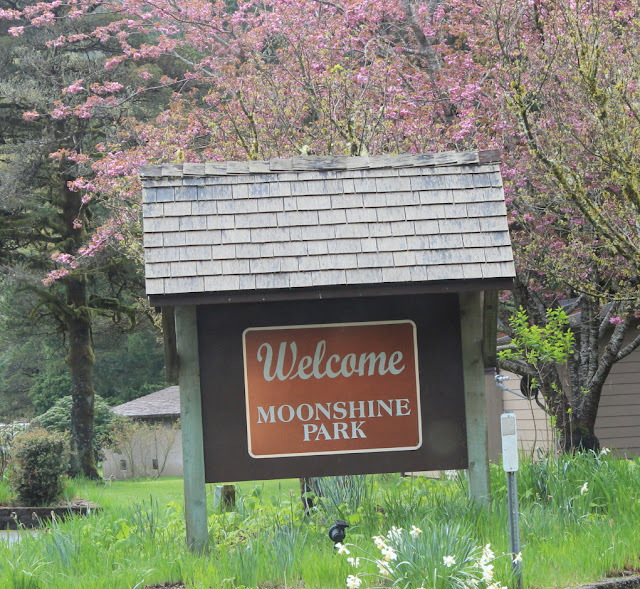 From Moonshine Park, we head back the 20 plus miles to Route 101 north. 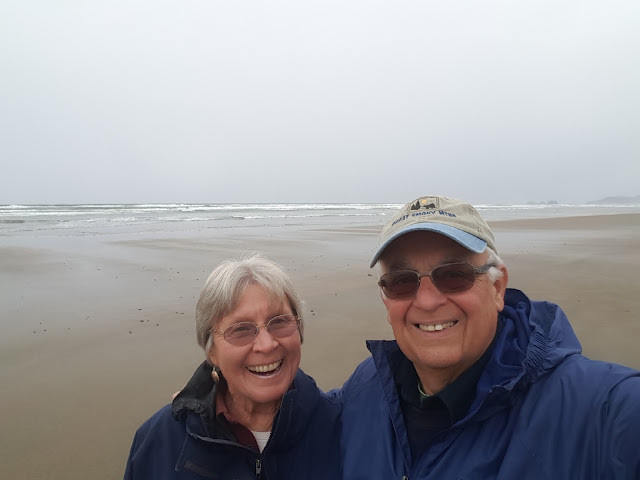 In Lincoln City, Jan and I are looking at Devil's Lake State Park. But, as we look around, we note that the campground is quite wet---flooded in spots. 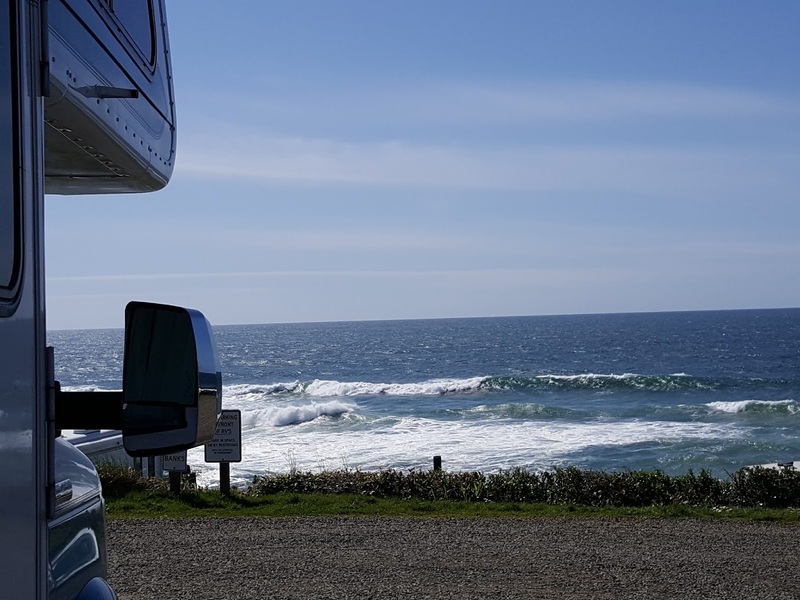 So we head down to another well rated private campground, Sea and Sand Sea and Sand RV Park. 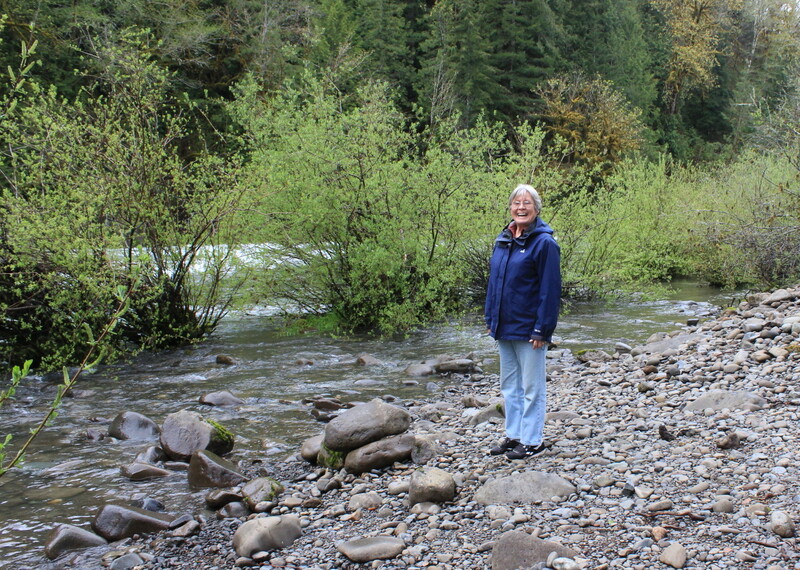 There are many campsites in the park, but we opt for the last waterview site---we are lucky. There are three rows of terraced water view sites. All have a great view. Note that there is a row in front of us, but you only glimpse the tops of their units. 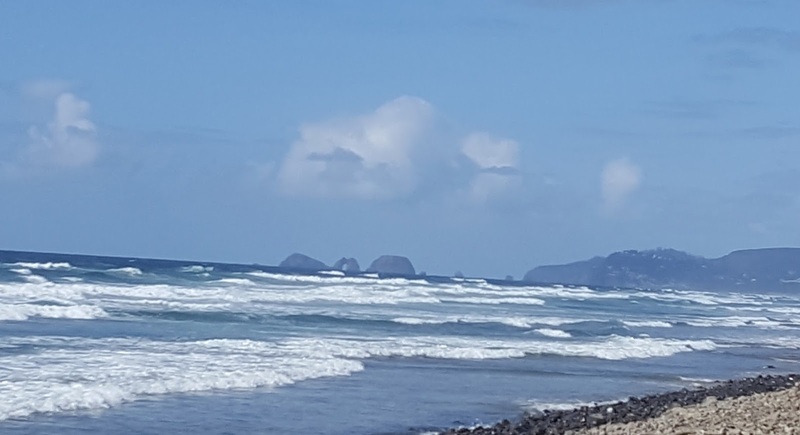 While here, we look for whales which are often sighted daily. We do see a few just out beyond the waves. We do note that this park offers 2 free nights of camping to active military through Tents for Troops, active ID required. Yes, we had a day of sunshine! The sunset takes place right in front of our Lady Blue. Many campers had propane outdoor fireplaces--no wood fires in this section. They sat around their fireplaces outside and watched the sunset---quite beautiful. Tillamook. Route 101 heads inland here and we see many farms on the narrow winding road. Our first stop is at Tillamook Cheese Factory. We had stopped there three years ago for a great tour of the factory. This year, they are renovating the entire plant. It was still a good tour with some delicious ice cream and cheese at the end. A few miles south is Blue Heron French Cheese Company. This is one of our Harvest Host stops where we get to camp overnight . Scattered around the property are numerous rusty items. One, I particularly like was this old Mack truck. A hand starter crank still attached. And note the wooden wheel spokes. This link will take you to pictures of 1900 to 1916 or so trucks. Scroll down in the link until the pictures start. Note the metal wheels. But newer models worked and still work the same way. Answer at end of this issue. We have noted many more of these electric car charging stations while crossing the country this year. There are two stations here. Some towns are making it a priority to install faster charging spots as the newer cars offer greater distance between charges. No fee for charging. Besides the cheese store, there is also a petting zoo. These hens are roaming the grounds. 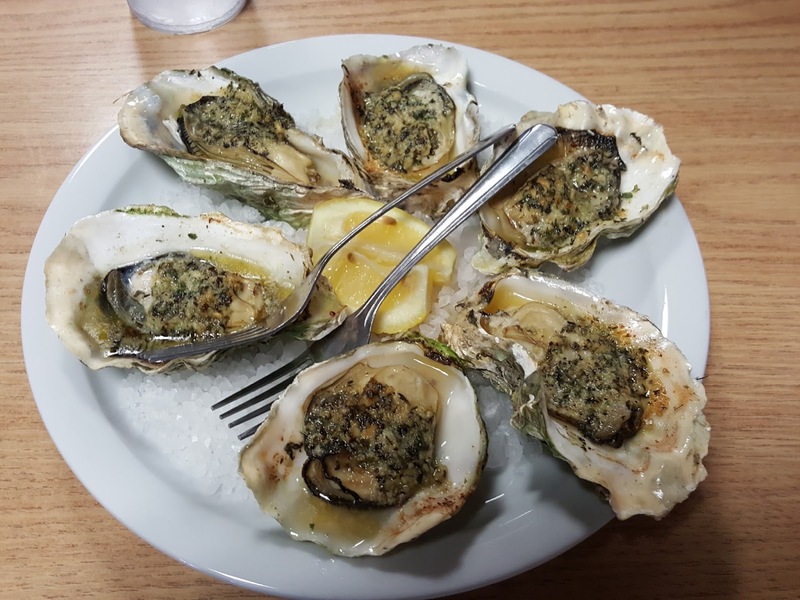 Inside the store, Blue Heron offers wine tasting of selected regional wines, a deli restaurant setting with great clam chowder, fresh breads for sandwiches and more. Also a gift section with unusual cards and gifts. 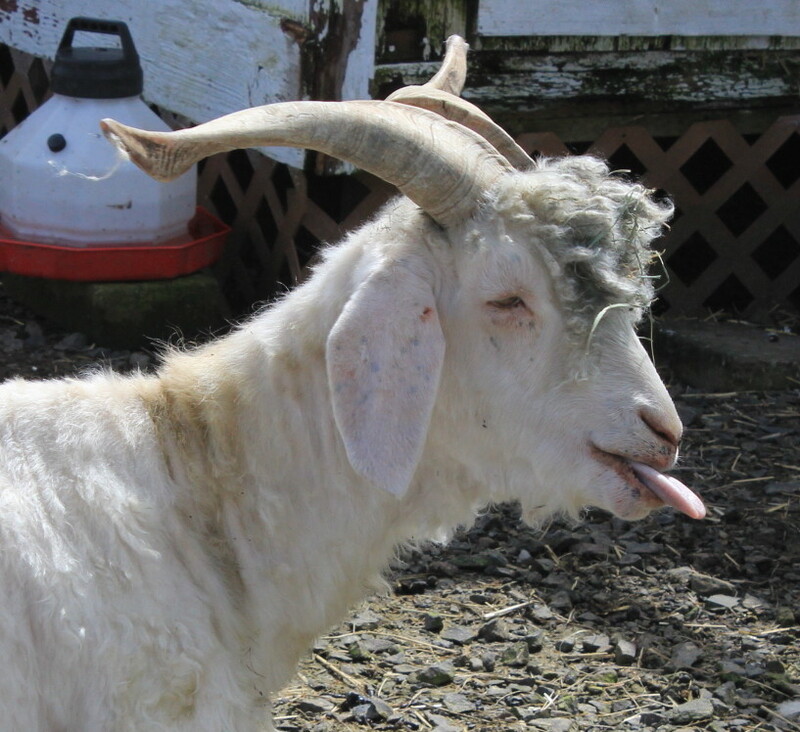 Not to mention goats and other animals. In the spirit of being helpful, Jan and I offer this picture for you to copy and save. Just in case you have that special relative , fellow worker, or other nominee that might need to have this picture---------------accompanied, of course, by appropriate text. A wonderful host at Blue Heron suggested the Fish Peddler for Oyster Stew and more. Just above Tillamook at Bay City, and not obvious from Route 101, it is highly recommended. These are their Trask Baked Oysters. 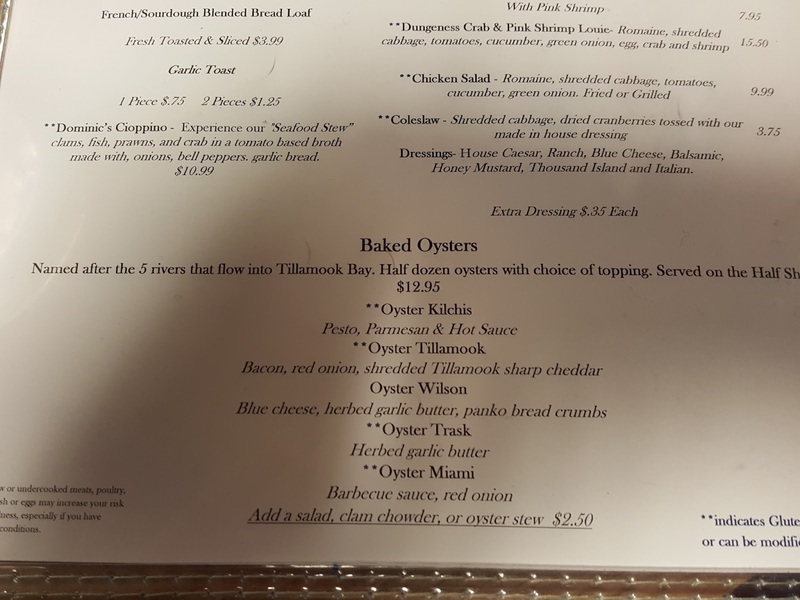 Jan and I also were quite impressed by the Oyster Stew. 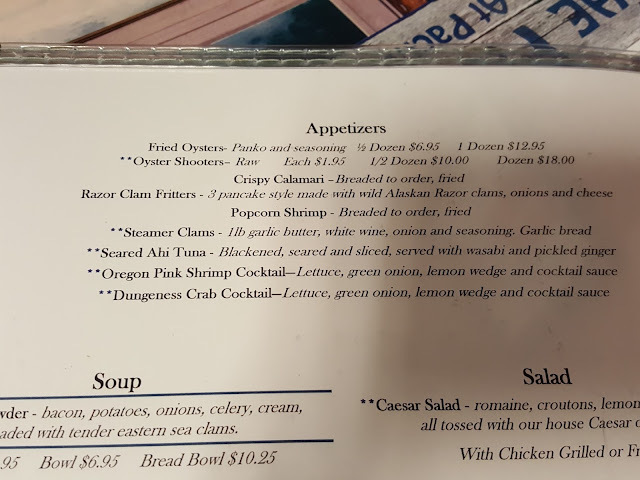 We would have liked to have tried their steamers, but we were full. Note the Razor Clam Fritters--the razor clam shells we see on the beach are bigger than our Cape Cod razor clams. There were piles of Dungeness Crabs in the cooler for sale--quite popular here. This link will take you to a short video of the restaurant. 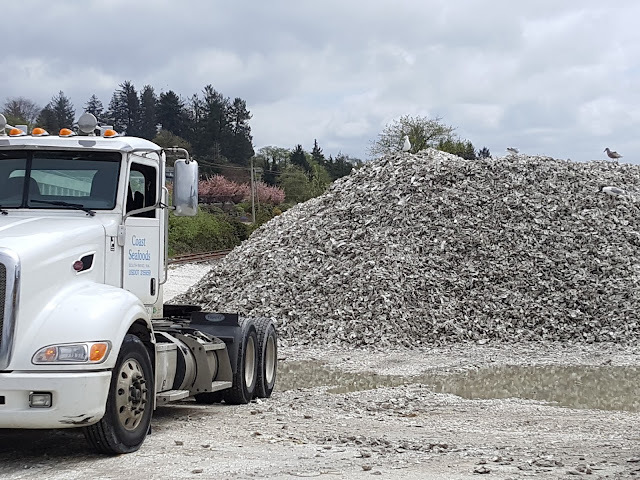 Just one pile of oyster shells at the restaurant. 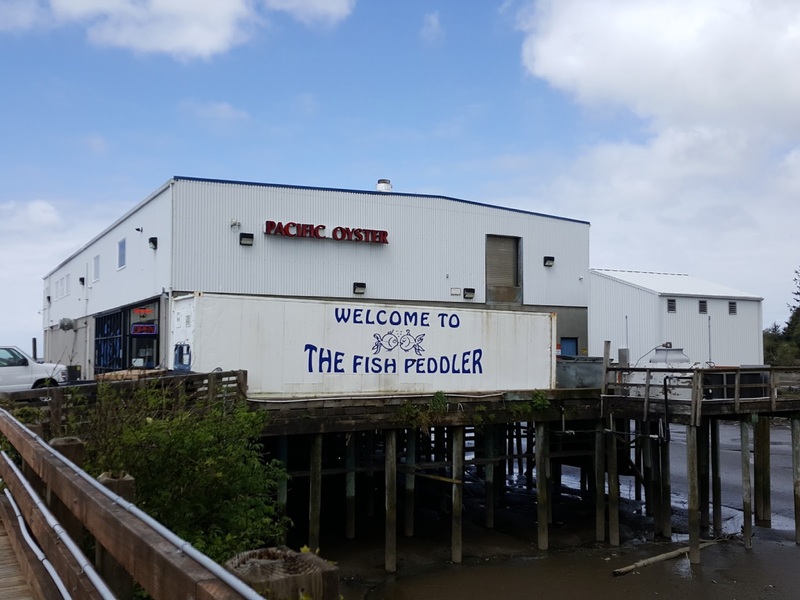 In the same building, on a weekday, you might see workers processing oysters and more. The packaging business in known as Pacific Oyster. While we were here, a large trailer truck came to haul away a container of oyster shells. 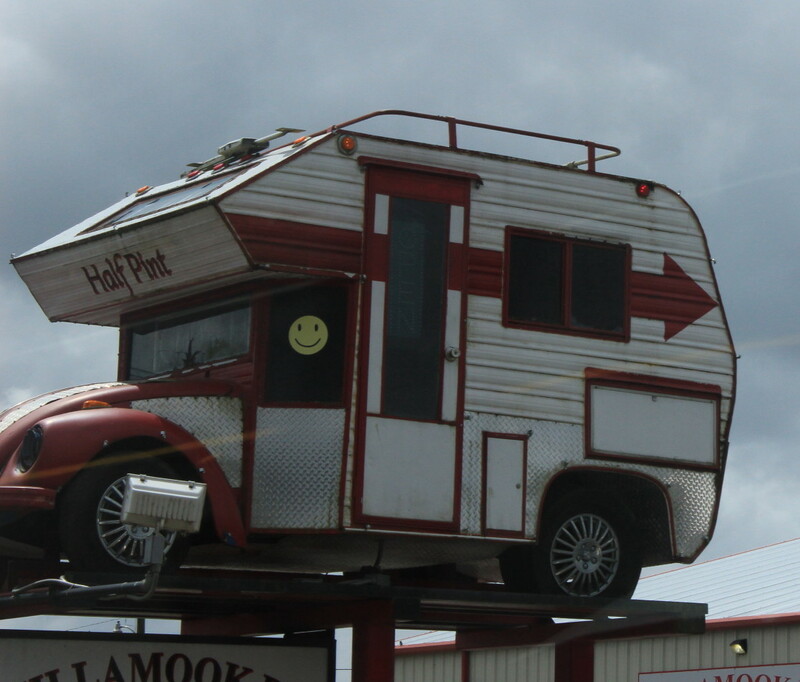 We couldn't resist this little camper perched on a signpost in Tillamook. Note that it is built on a VW Beetle body. From Bay Point, we head south on Route 101 to Route 131 that heads over to the Three Capes Scenic Loop. This includes Cape Meares, Cape Lookout, and Cape Kiwanda. Our first stop is Cape Meares for the Cape Meares Lighthouse. Yes, that is the top of the light house ahead. This is one of the shortest lighthouses at 38 feet tall. 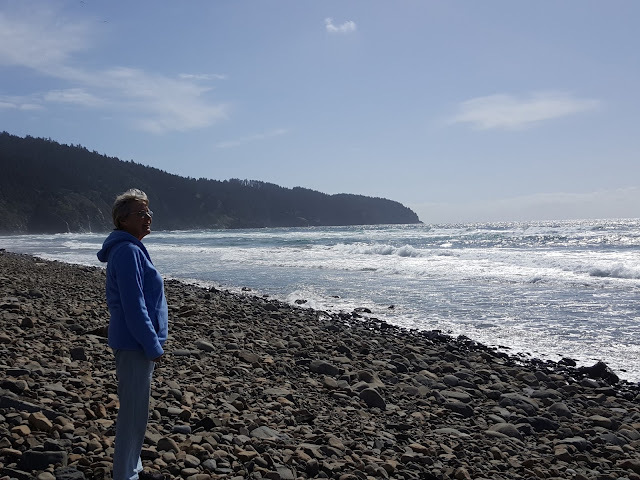 A beautiful section of the Oregon coast and not far from the center of Tillamook. 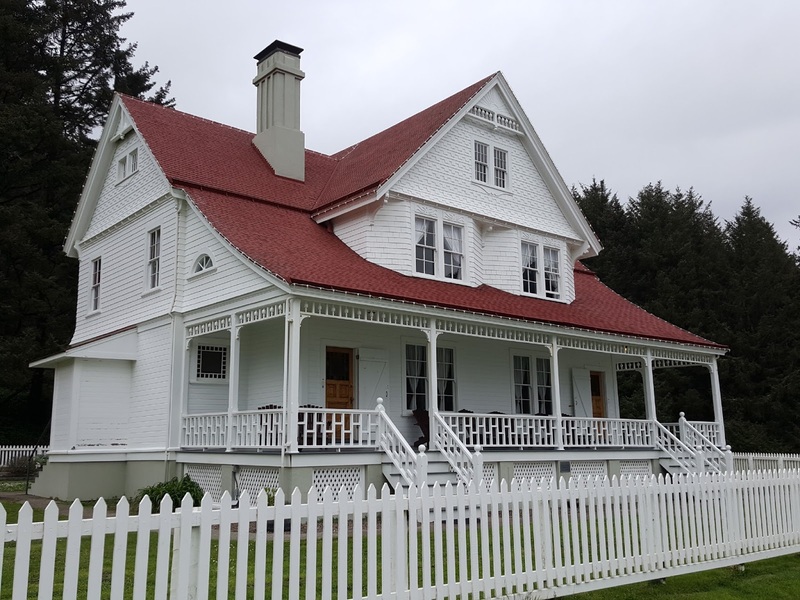 These houses are located at Oceanside which is on the way to Cape Meares. Not many For Sale signs. Located at Meares Park is this Octopus Tree. 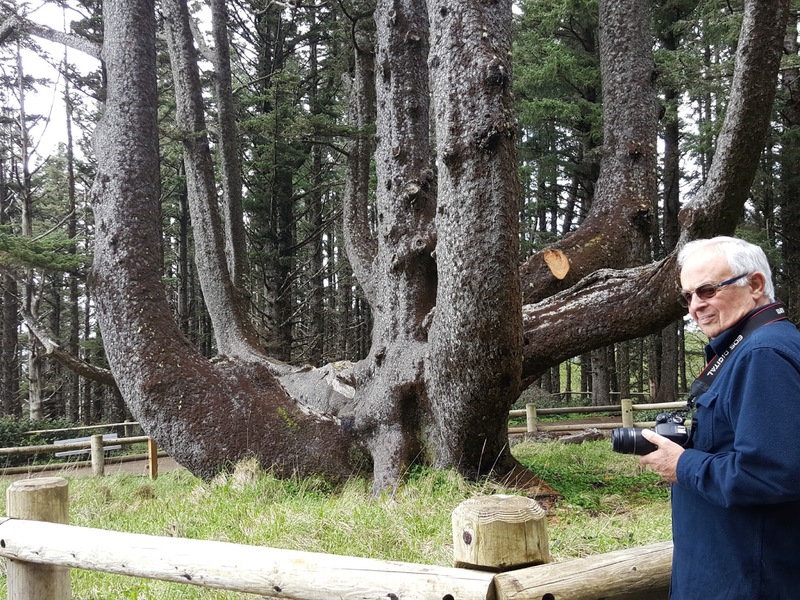 It is a Sitka Spruce. 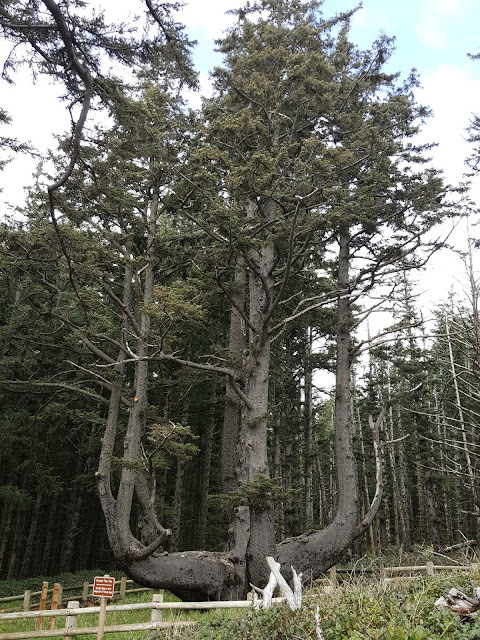 The largest known Sitka Spruce in Oregon. Have to get back a distance for a picture of the entire tree. 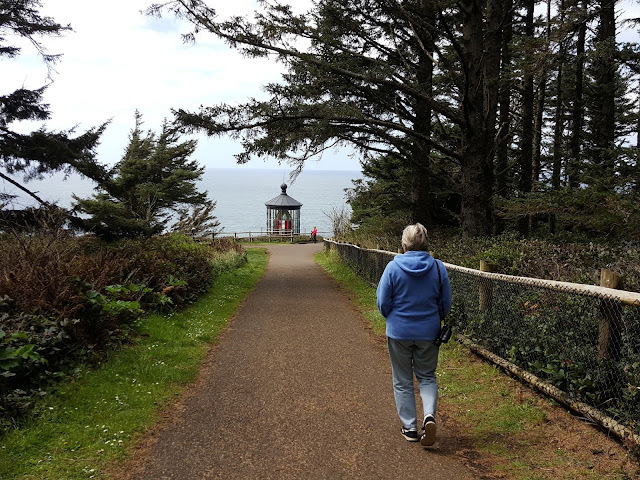 From the viewpoint at Cape Meares. There are Peregrine Falcons and many shore birds that find this to be a great home. 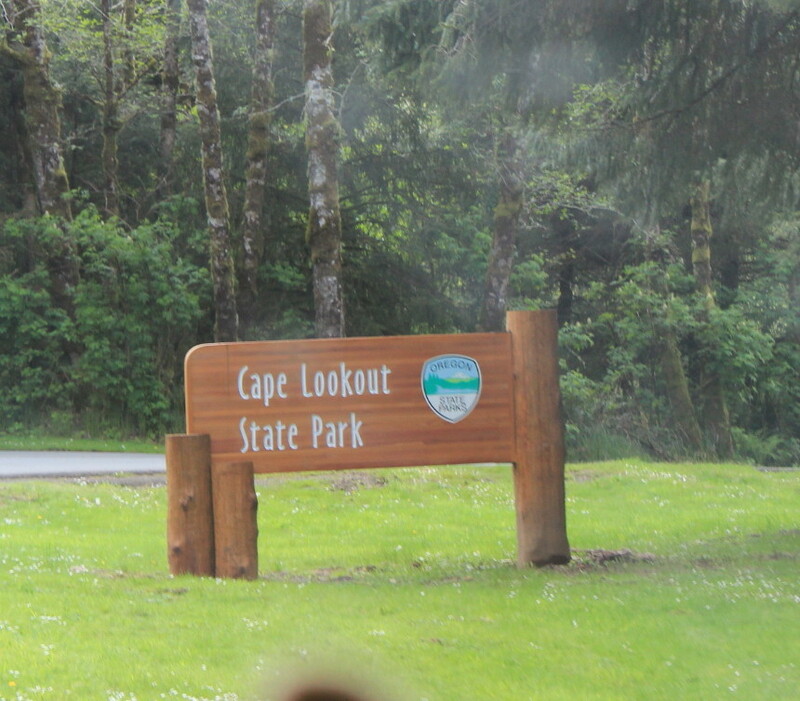 Heading south on the loop(Route 131) Jan and I stop at Cape Lookout State Park. While our campsite($21 dry camping per night) does not have a view of the ocean, it is about a 2 minute walk over the dunes to the beach. 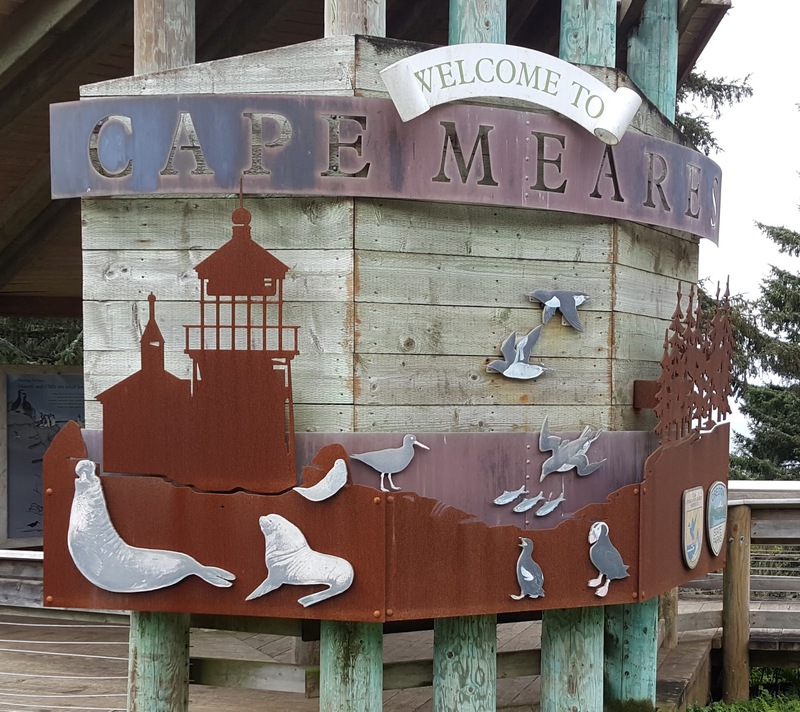 Our look north shows the large rocks off Cape Meares. 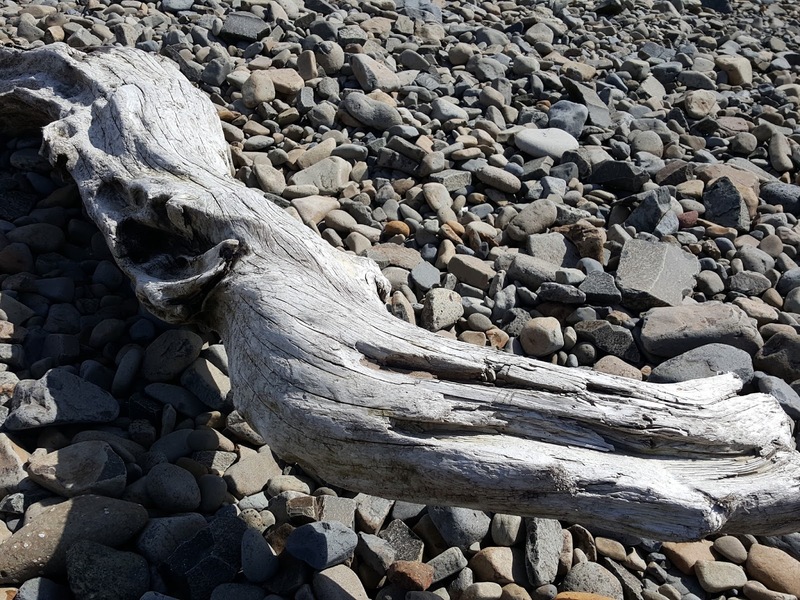 A little of the driftwood on the beach. Sections of the north Oregon coast, especially near Astoria, have a tremendous amount of driftwood on shore. The skunk cabbage is still in bloom. 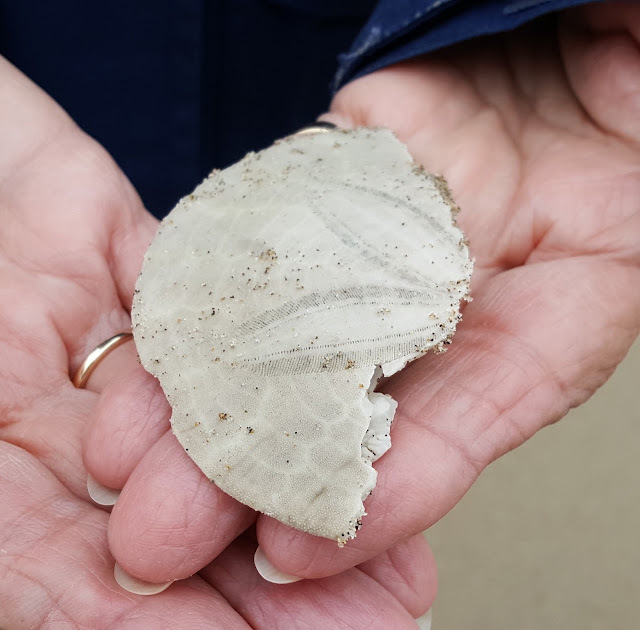 A number of pieces of large Sand Dollars on the shore. A little too chilly for wading, but probably some nice examples not too far into the water. 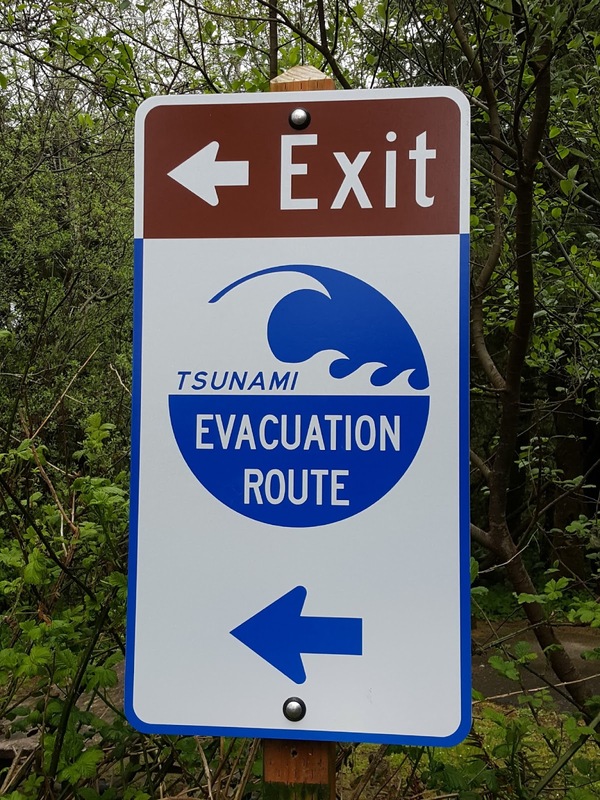 The Oregon Coast has a number of signs to indicate Tsunami Evacuation Routes. We don't think too much about this but the Pacific coast has had some history with Tsunami's. A large Tsunami was created by an earthquake in Alaska in the 1950's. The result was a number of lives lost along the Oregon coast. In 2011, there was the earthquake and following Tsunami created in Japan. 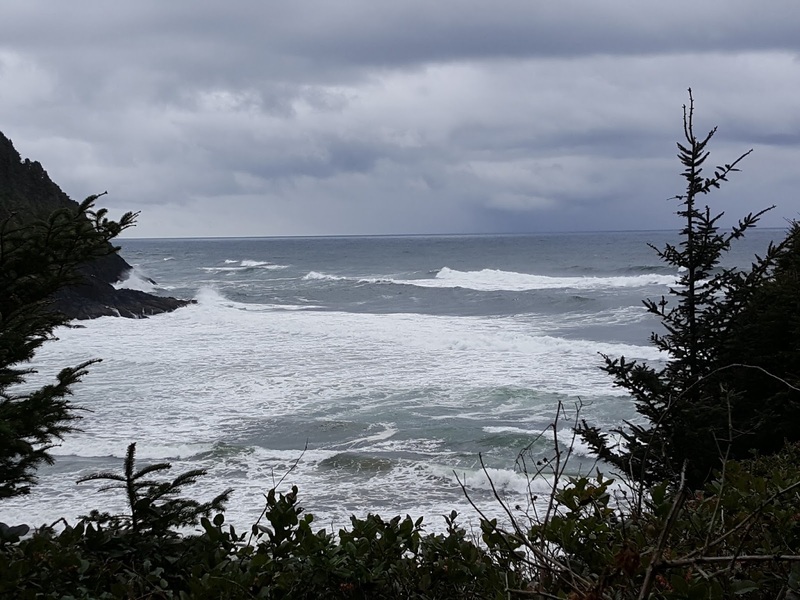 Three waves reached the Oregon coast, only 3 feet high , but with power and channeling created quite a bit of damage in places like Brookings, Oregon and Crescent City, California. The following HD video is from Crescent City, California, about 3 minutes long. Nothing much happens at the beginning, but watch the force and amount of water that begins to enter the harbor. And then watch what happens to the boats still there. All this all the way from Japan. And once again, very rainy weather. But---Jan and Bruce are still smiling!! No crowds on the beach. By the way, the answer to the picture at Blue Heron.